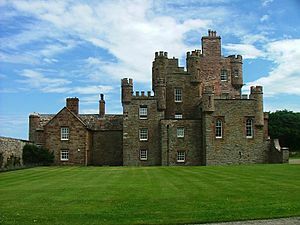 The Castle of Mey (formerly Barrogill Castle) is located in Caithness, on the north coast of Scotland, about 6 miles (9.7 km) west of John o' Groats. In fine weather there are views from the castle north to the Orkney Islands. The lands of Mey belonged to the Bishops of Caithness. The Castle of Mey was built between 1566 and 1572, possibly on the site of an earlier fortification, by George Sinclair, 4th Earl of Caithness. Originally a Z-plan tower house of three storeys, it had a projecting wing at the south-east, and a square tower at the north-west. The Castle passed to George Sinclair's younger son William, founder of the Sinclairs of Mey, although it later became the seat of the Earls. The Castle's name was changed to Barrogill, and the structure was extended several times, in the 17th and 18th centuries, and again in 1821 when Tudor Gothic style alterations were made, to designs by William Burn. Barrogill passed out of the Sinclair family in 1889, on the death of the 15th Earl, and in 1929 it was purchased by Captain Imbert-Terry. The Castle was used as an officers' rest home during the Second World War, and in 1950 the estate farms were sold off. The castle was in a semi-derelict state when, in 1952, it and its policies (attached lands) were purchased by Queen Elizabeth The Queen Mother, the widow of King George VI, who had died earlier in the year. The Queen Mother set about restoring the castle for use as a holiday home, removing some of the 19th-century additions, and reinstating the Castle's original name. She regularly visited it in August and October from 1955 until her death in March 2002; the last visit was in October 2001. In July 1996, The Queen Mother made the property, the policies, and the farm over to the Queen Elizabeth Castle of Mey Trust, which has opened the castle and garden to the public regularly since her death. It is now open seven days a week from 1 May until 30 September each year, with a closed period of ten days at the end of July and the beginning of August, when Their Royal Highnesses The Duke and Duchess of Rothesay usually stay at Mey. The Trust opened a new Visitors Centre in early 2007, and the visitor numbers for that year topped 29,000. The castle is in Netflix show "the crown" Episode 8. Castle of Mey Facts for Kids. Kiddle Encyclopedia.